This dumpling recipe has extra flavor from fresh herbs. Just imagine a pot of simmering delicious stew with tender herbed dumplings waiting for you after a hard day. These little gems are easy to make and take just 20 minutes to cook on top of hot stew. In a large bowl combine the flour, baking powder and salt. In a smaller bowl combine the buttermilk and butter. Add the buttermilk mixture to the flour mixture and stir just until the mix forms a soft dough. Stir in the green onions and thyme. Drop the dough by the spoonful on to hot simmering stew. Cook, uncovered, for 10 minutes then cover and cook for an extra 10 minutes or until the dumplings are firm but not totally hard. You can also substitute 1 teaspoons chopped fresh or 1/4 teaspoon dried herbs (basil, sage, celery seed or parsley) for the thyme. 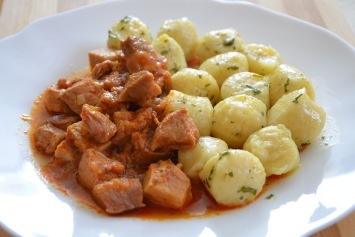 These dumplings would taste great cooked over hot chicken stew, but how about beef stew, goulash or even chili! It makes my mouth water just thinking about it. Really, anything that is cooked in a gravy or thick sauce could be topped by this herbed dumplings recipe. Even beef Bourguignon, although many Frenchmen would think that almost sacrilegious. Do you like this recipe? I’d love you to Pin it to Pinterest, Tweet about it, Like it on Facebook and leave a comment below. You will find another dumpling recipe here. Find wonderful stew recipes here.